(Nanowerk News) Orange juice, both delicious and nutritious, is enjoyed by millions of people across the world every day. However, new research indicates that it could have potential far beyond the breakfast table. The chemicals in orange peel could be used as new building blocks in products ranging from plastics to paracetamol – helping to break our reliance on crude oil. Today’s society is totally reliant on the chemicals and materials that are obtained from our diminishing supply of fossil fuels. As such, there is an increasing global focus on the development of renewable chemical feedstocks from a variety of sustainable sources such as sugarcane and fatty acids in the production of biofuels. And the chemically rich essential oils contained within waste citrus peels are another such source that is being investigated with real zest. This is promising, as the orange juice industry uses highly inefficient and wasteful juicing processes, with almost 50% of the fruit thrown away. This gives a real opportunity, then, to develop a sustainable supply of chemicals from the diverse and plentiful molecules locked within the peels. Recent figures estimate around 20m tonnes of citrus is wasted each year. As some 95% of the oil extracted from these waste rinds is made up of limonene molecules, a colourless liquid hydrocarbon known as C10H16, this waste could yield around 125,000 tonnes of limonene a year. Limonene structural formula Current extraction methods rely on distillation, passing steam through the waste solids and simply collecting the resulting oil. But recently, researchers at the University of York began investigating microwave extraction techniques as a greener alternative ("Microwave assisted extraction as an important technology for valorising orange waste"). The team simply placed orange peel and an organic solvent into a microwave and heated for 30 minutes. Within the peel, the water molecules start to boil, rupturing the cells and allowing the limonene to leach out. The results are favourable; the process is much faster, less energy intensive, produces a higher quality of limonene and in a yield twice as good as conventional methods. But what is it that makes limonene so useful? As a simple hydrocarbon, it shares many similarities with the chemicals we obtain from fossil fuels, such as its liquid nature and boiling point. Therefore the technology we currently use on petrochemical feedstocks can be directly used on limonene to turn it into useful products. We can do this by exploiting limonene’s two carbon double bonds for a variety of chemical transformations. Perhaps limonene’s greatest potential is as a building block for the polymer industry. Chemists are always looking for new ways to join molecules into long polymer chains so they can be used in a range of products, such as the polypropylene (a chain of propylene molecules) fibres that we use in carpets, or polyethylene (a chain of ethylene molecules) for making plastic bottles. Back in 2006, scientists at Cornell University first showed the how fruitful this strategy could be ("Alternating Copolymerization of Limonene Oxide and Carbon Dioxide"). By reacting limonene oxide – a limonene molecule including an oxygen atom – with carbon dioxide in an alternating pattern, they could create polyesters, used in many woven or knitted fabrics. This groundbreaking work has been followed up in recent years through a variety of other polymer-forming reactions. This has included other forms of polyesters by replacing carbon dioxide with alternative building blocks. Polyurethanes are a family of synthetic polymers that have found their ways into many of our homes from foam cushions to shoe soles. Currently the raw materials are obtained from fossil fuels, however limonene-based replacements have been recently identified. For instance, researchers in Germany have produced a family of new polyurethane-like plastics with limonene at the centre ("Cyclic limonene dicarbonate as a new monomer for non-isocyanate oligo- and polyurethanes (NIPU) based upon terpenes"). The properties and hardness of these materials could be easily tuned to make a range of household products. The development of limonene-based materials does not stop at everyday consumer products. Advanced optical materials have been recently been prepared by using limonene as a binder to make thin luminescent films ("Sunlight-Induced Cross-Linked Luminescent Films Based on Polysiloxanes and d-Limonene via Thiol–ene “Click” Chemistry"). The production of medicines from limonene may also one day be a reality. My team at the University of Bath is investigating the production of paracetamol using limonene’s carbon skeleton at its core. Through a series of chemical transformations combined with state-of-the-art engineering, we hope to turn waste orange peels into this widely used pain relief drug. Limonene certainly has the potential to become an important component of a bio-based chemical industry. The field however is still in its infancy with no commercial limonene-based plastics on the marketplace. Issues that need to be addressed include a finding a reliable supply and greener processing – many of the above processes for manufacturing polymers using limonene still require petrochemicals as additives. Limonene and its wider family (called terpenes) are only one piece of the renewable feedstocks puzzle. For example polylactic acid, a sustainable polymer derived from corn starch has been commercially available for the past decade primarily as disposable packaging. Other plastic building blocks have being sourced from plant materials such as Coca Cola’s PlantBottle technology. These alternative renewable sources can contain large amounts of oxygen atoms giving the resulting polymers different but complementary properties to limonene-based plastics. The availability of limonene is also dictated by the weather in Florida and Brazil and by our desire to drink orange juice. Even if all of the currently available limonene from citrus waste was made into polymers it wouldn’t make a dent in global levels of plastic production. 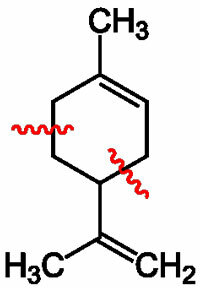 However, if we could make the most of all the citrus that gets wasted, the amount of available limonene would increase. More efficient extraction methods will also boost availability as will advances in biotechnology. My team is also investigating how to modify bacteria to feed off municipal waste and excrete limonene as its only product. These sort of advances may be a way off but they are important first steps to breaking our dependence on crude oil – molecules such as limonene will no doubt be a bright part of our future.